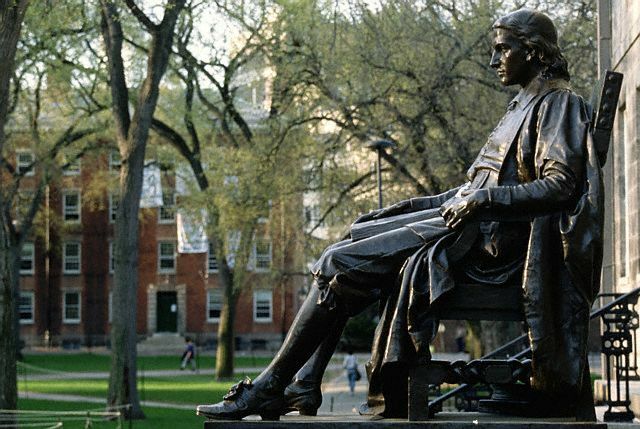 The value of a “Harvard education” — which draws students around the world with its promise to produce the future “citizen-leaders for our society” — is inextricably linked to the university’s affirmative action policy. The two of us – Sally, a Chinese American senior at Harvard, and Itzel, a Xicana who graduated in 2017 – owe our education to Harvard’s race-conscious admissions policy. We just testified in the lawsuit SFFA v. Harvard, which claims that Harvard’s policy discriminates against Asian American applicants. This lawsuit echoes the “model minority myth” — the myth that Asian Americans are more successful than Blacks, Latinos, and other communities of color — and implies that colleges cannot address unequal opportunities for some students without discriminating against others. If you believe the “model minority myth” – and many people do – you might assume that Sally, who is Asian American, was accepted in spite of Harvard’s race-conscious policy, and Itzel, who is Latina, was accepted only because of it. And you might be surprised to learn that, when we applied, Sally was warned that she wouldn’t be accepted because of her imperfect grades and SAT scores, while Itzel graduated with a 4.5 GPA and 10 AP college credits. Both of us, nonetheless, were admitted due to Harvard’s race-conscious admissions policy, because the policy has very little to do with grades or test scores. Instead, it acknowledges that our respective ethnicities and races, which influence so many of our choices and experiences, cannot be set aside when evaluating our merit. Race has played different roles in our lives, and in how our applications were evaluated. On one hand, as women of color, our histories and experiences are in many ways intertwined. When our parents and grandparents came to this country in search of a better life, they were met with prejudice and injustice based on the color of their skin, their names, and the languages they spoke. This prejudice and inequity still affect us both daily. On the other hand, we are different women who have faced distinct circumstances. Sally, for one, is from San Francisco, a place where diversity is disappearing daily, while Itzel is from a rather diverse city in Southern California. Our respective personal essays described how our races intersected with a confluence of factors to shape who we are. In its holistic review of our applications, Harvard ultimately judged that our unique backgrounds would contribute to its campus. The impact of race-conscious admissions on our educations, however, amounts to much more than the acceptance letters we received in the mail. Difficult as it may be for high school seniors to imagine right now – and we’ve been there, too – getting accepted is far from the hardest thing about college. Simply put, race-conscious admissions has less to do with getting into Harvard than with making Harvard a school that so many want to attend. The effects of race-conscious admissions can be seen in the diverse cohort of students at Harvard, present and past. Before either of us ever set foot on campus, the students of color who came before us carved out spaces where we could find people like ourselves, to resist the isolation of representing all that we are to an institution that was not built for us. Before either of us ever set foot on campus, the students of color who came before us carved out spaces where we could find people like ourselves, to resist the isolation of representing all that we are to an institution that was not built for us. These spaces provided not only solace, but empowerment. Harvard’s diversity allows for robust racial justice advocacy, and we both became committed advocates for low-income students of color like ourselves. Sally actively promotes the interests of Asian Americans, including mobilizing Asian American voters and directing a program that provides citizenship exam prep to Chinatown residents. Itzel was an active member of numerous Latinx and Native American student groups, including Concilio Latino, Fuerza Latina, RAZA, Latinas Unidas, and Native Americans at Harvard College (NAHC). When we met, it was to advocate for an Ethnic Studies department. Racial justice advocacy was the defining feature of both of our college educations, and where we developed the leadership skills that Harvard promises its students. The effects of race-conscious admissions can also be seen in the conflicts that pushed us to learn and mature. Institutions of Harvard’s caliber promise to provide relevant, thorough, and responsible training for the multicultural world we must one day lead. Such an education cannot be provided in a rich, white bubble. At Harvard, we met people from different ethno-racial and socioeconomic groups, who each brought valuable life experiences and points of view to the classroom and social spaces. We were challenged to reflect on our own privileges and initiate difficult conversations in order to become better advocates for positive change, both on and off- campus. Schools like Harvard still have a long way to go in providing a world-class education that accurately reflects the U.S. and world population. But affirmative action has allowed for decades of progress, and gives a “Harvard education” the value that it has today. It certainly did for the two of us. Itzel Vasquez-Rodriguez and Sally Chen are current and former students of Harvard University, and are working with Advancing Justice – Los Angeles and the Lawyers’ Committee for Civil Rights Under Law .